Hyde Lake, Located 15 miles from the main house, is 300 acres and home of hard fighting, line stripping, knuckle busting Rainbow Trout reaching upwards of 33”. 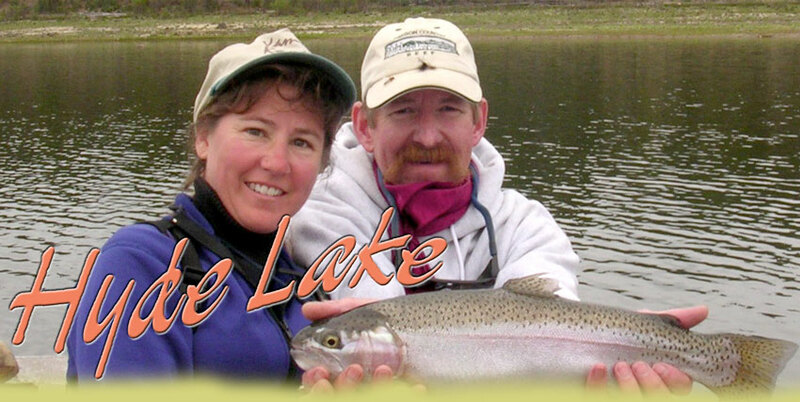 We stock the lake every spring with 7”-10” trout and the abundance of leaches, damsels, may flies, and other aquatic life help them to almost double their size in the first year. The south end of the lake reaches depths of 50 feet when full and shallows up to about 5-10 feet on the north end. The lake was built in the mid 1970’s by Dayton Hyde and sons. Hyde Lake is a great place for people who are looking for a day trip with the kids or just looking to relax in a canoe watching ducks and geese. Guests staying at the ranch have access to both the lake and river. Day fishing on Hyde Lake is available for $150 per rod day.